Gazing down into a sea of empty chairs, Newt Gingrich reasserted that he positively doesn't need any of you. 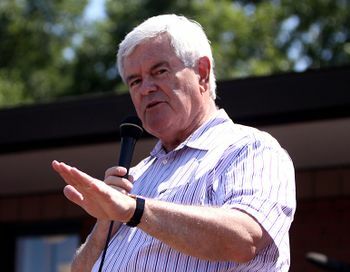 RADIUMDALE, Idaho -- After firing his entire campaign staff since he ran out of money, Newt Gingrich was heard screaming from across the street that he doesn't need you, he doesn't need anybody. The former House speaker, whose viability as the Republican candidate in this year's presidential election is seen as dropping by the day, is now his own publicist, stylist, campaign bus driver, cook, mechanic, sound and video technician, and launderer. The final members of his staff were thrown out of the campaign office at midnight Tuesday while being pelted with Gingrich 2012 buttons. Alone, Gingrich has taken to the road in his campaign bus, driving with one hand while throwing campaign leaflets out the window with the other over thousands of miles of highway. Police officers have avoided pulling him over and ticketing him for littering out of sheer pity. "I don't need ANY of you," Gingrich announced to a group of confused middle school students waiting for the bus at Radiumdale Junior High. "I can be president. I CAN BE PRESIDENT." When the school doors opened he blocked the doorway and began yelling "Come on! $2.50 a gallon for gasoline! Why isn't that enough? Why don't people like me!?" He then began to cry as the kids threw spitballs at him. Gingrich has been campaigning heavily in the tri-state area while he tries to figure out how to change the flat on his bus. Early reports indicate he may be in the mid-west for some time, and other patrons at the Radiumdale Go-Go Gas, where the bus is parked, report that he can be heard in the evenings cursing at the tire and yelling that he's the new Ronald Reagan. Regular patrons report that they can no longer meet his gaze. Just before press time, the Romney campaign bus pulled through town, slowed down as it passed the Go-Go Gas, where Gingrich was sleeping on packs of road salt, and then sped up again. This page was last edited on 5 June 2012, at 07:00.